They dwell in their own countries, but simply as sojourners. As citizens, they share in all things with others, and yet endure all things as if foreigners. Every foreign land is to them as their native country, and every land of their birth as a land of strangers. They marry, as do all [others]; they beget children; but they do not destroy their offspring. They have a common table, but not a common bed. They are in the flesh, but they do not live after the flesh. They pass their days on earth, but they are citizens of heaven. They obey the prescribed laws, and at the same time surpass the laws by their lives. They love all men, and are persecuted by all. They are unknown and condemned; they are put to death, and restored to life. They are poor, yet make many rich; they are in lack of all things, and yet abound in all; they are dishonoured, and yet in their very dishonour are glorified. They are evil spoken of, and yet are justified; they are reviled, and bless; they are insulted, and repay the insult with honour; they do good, yet are punished as evil-doers. I just started reading a fascinating new book about the early church. I often read about the early church with a sense of astonishment. Their world and mine are like stars in separate galaxies. The breadth of my Christian experience bears very few lasting vestiges from the first three centuries. They had to wait two to three years before they could be baptized. They met early in the morning and the evening on most days of the week. Their access to the biblical text was often limited. They lived in a world of actual persecution. They saw themselves as citizens of heaven alone and refused to show any allegiance to Rome. They often had to meet in secret. They liked keeping their meetings small. They risked life and limb to serve and love their enemies. They lived in a highly stratified society—many of them were people with zero social power (e.g. slaves, women, children). Most of them couldn’t read and write. No lightshows. No powerpoints. No sermon handouts. No carpet. No felt-boards. No hymns versus choruses. No blogs. All this to say nothing of the disparity in theology . . . worlds apart. There is one small, but important intersection: mentoring. New Christians underwent a two to three year period of what we might think of as mentoring. A seasoned Christian would lead a small group in a rigorous schedule of instruction. This process appears to have been quite intimate; the goal was to create space for Christ to be the king of every attribute of their lives. A woman who lived under a powerful pagan husband might ask questions about how to conduct herself during pagan festivals. Slaves might have similar questions about how to interact with their household’s religion. Female slaves were often consorts for the head of the house. These brave women would surely have had uncomfortable and creative conversations about what their new life in Christ would look like. This period of mentoring was called the catechumenate. The sacred space this training created was crucial for the integrity, vitality, and mission of the early Christian communities. I’ve had lots of mentors: a few excellent ones and a few terrible ones. The biggest difference has to do with safety. The excellent mentors created space for honesty. These men opened their attention to me in a way that I knew I could say anything. I also knew that their voices of response would be filled with generous grace and focused wisdom. Bad mentors just tell you what to do. The worst mentors don’t listen closely enough to the complexities of what you’re saying in order to give you a relevant answer. And then they think their advice saved you. All the while, you walk away thinking, how do I get myself out of this? But those excellent mentors safely listen and speak in ways that have illuminated my path time and again. The biggest difference between my mentoring experience and the catechumenate is that theirs was a built-in system. Today’s mentoring is haphazard, shall we say, organic. If there was a built-in system I’m not sure it would work very well. There are just too many self-righteous Christians out there who think they’d make great mentors. And too many humble Christians who think they couldn’t be a mentor. I actually think that one of the best ways to make mentoring happen is to forget the term altogether and switch it out for “encouragement and listening.” If you focus on encouragement long enough it will turn into a discipling relationship that fortifies the Kingdom pursuits of any Christian community. Especially, if you equally focus on creating safe, listening space around you. Safety in Christian community is the only way to really know each other. If you don’t feel safe, you won’t be authentic, and therefore won’t be known for who you really are. Encouragement and listening draw together genuine and, thus, catechumenate-style relationships. I know a few people who are excellent encouragers and listeners who are acting as life-changing mentors in our congregation and they have no idea. Personally, I think that’s excellent. However, I think this is also a place where we must grow. People in our midst and our neighborhood are starving to be known in safety. Lucky you, two pictures! When I think about safe conversations I can't help but think about a warm cup of coffee. 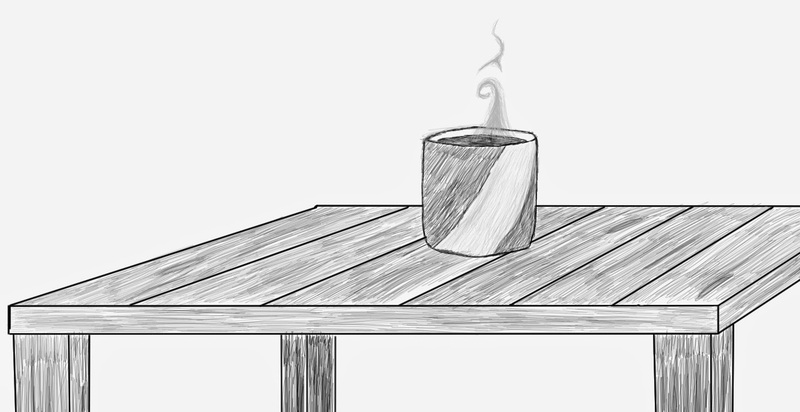 So many important conversations have happened over coffee that I couldn't resist the impulse to draw a cup. So here we are in the midst of an extended conversation about community and I’m giving you pretty basic, straight-forward, concrete instructions: open your ears and when you open your mouth use it to inject courage into people. Will you set your focus on these two things with me? Perhaps if we slow down and create this safe space around each one of us we will re-enact a shadow of the early church’s genius. Perhaps we will be a community, not galaxies from the early church, but worlds apart from the shallow, self-centered relationships that so often deteriorate individuals in our society and in our churches. Roberts-Donaldson translation. Full text here. There is some dispute about how old these words are, but they are generally thought to reflect the outlook of the second-century Church. Catherine Gunsalus González’s, Resources in the Ancient Church for Today’s Worship—thanks Debbie! When I say “early church,” I mean the first three hundred years. Only about two percent of the general population could read and write. This meant that having copies made of scripture was very costly. Once a church got a copy of scripture it was their prized possession, which made it a target of Roman fires during times of persecution. Even if your church had a copy of the scriptures very few could use it for personal devotions the way we do, because they wouldn’t be able to read it. So they would meet often to have a literate person read it aloud. They also created great works of art to illustrate biblical stories and lessons in order to make them easier to remember. I find it terribly disrespectful when we refer to changing attitudes in America as “persecution.” I think it is disrespectful, because churches aren’t being burned down; no one is serving time in prison without trial; there are no wild beasts to devour our flesh. Cultural antagonism is simply not the same thing as persecution. If you have cancer and I have a cold and I say to you, “glad we’re sick together,” how would that make you feel? A large group is not easily concealed. Although, sometimes blogs feel like a revival of the ancient practice of writing letters of instruction, inquiry, and encouragement. On the other hand, they can also incite remarkable divisiveness. My description of the early church comes from a handful of resources. Two of the best would be, The Story of Christianity, vol. 1, by Justo Gonzalez or Water from a Deep Well, by Gerald Sittser. Also, I have a much more technical book, Christian Origins, Richard A. Horsley (ed.). This doesn’t mean that good mentors aren’t honest. They’ve often spoke hard-hitting truths to me, but they’ve earned the right to do so with their tenderness and steadfast understanding. Another advantage of ditching the word, “mentor,” is that it rids us of the nasty assumption that this is a one-way thing. Good mentors learn from their pupil. They discard the notion of hierarchy, and the hallmark of their safe space is a willingness to learn. Of course, it helps if you talk about Jesus, too. Just so you know, the early church had its problems. We know that some communities had a difficult time seeing slaves as full members. Their attitudes toward women vacillated between misogyny and empowerment. I wouldn’t say that I want to reinstitute the early church. I do want to learn from them in a way that helps us form a community that lives like Jesus in our current world—which could be said about studying any period of Christian history. 1) Reliability/Consistency (be accountable, trustworthy, do as you say, lead by example, be tenacious, etc.). Many folks who are broken have come to distrust others and view most people as having little integrity when it comes to doing as they say. Many well-intended mentors wind up losing interest, or finding excuses of why they don't have to be at a prison at 08:00 on a Saturday morning to visit with a brother who is struggling with faith. Not following through can be harmful not to just the individual, but beyond – think mustard seeds again; only with a negative connotation instead. 2) Listening. People who are struggling have questions (which we may not have answers for). Many times they simply need someone to hear their struggles in r/t. They need encouragement that comes from being a Spirit-led communicator. People serving time have probably had their fair share of being ignored, ridiculed, shamed, ostracized, etc. or a host of other things that have caused hardened hearts and bitter feelings. Attentive listening lets them know their thoughts and feelings have value and can have an immeasurable impact. 3) Be an example of a Christ-follower. People asking questions about committing their lives to Christ need examples. Chances are they have already experienced hypocrisy in others of what a life in Christ means. Do as you say and lead by example; God's light will shine through and know that no one on this earth is capable of escaping its reality. Luke 12:11-12 - King James Version (KJV): And when they bring you unto the synagogues, and unto magistrates, and powers, take ye no thought how or what thing ye shall answer, or what ye shall say: For the Holy Ghost shall teach you in the same hour what ye ought to say. Thanks for your insight Terry! You have more experience with this than most and I appreciate your perspective! Always the carpet! Glad you´re enjoying the book.